We left Edinburgh and the haar behind this morning and by the time we reached a friend’s house between Pathhead and Lauder, it was warm and sunny enough to have our coffee outside in the garden. After that we scooted over the hill on a B road between Lauder and Stow to the A7. 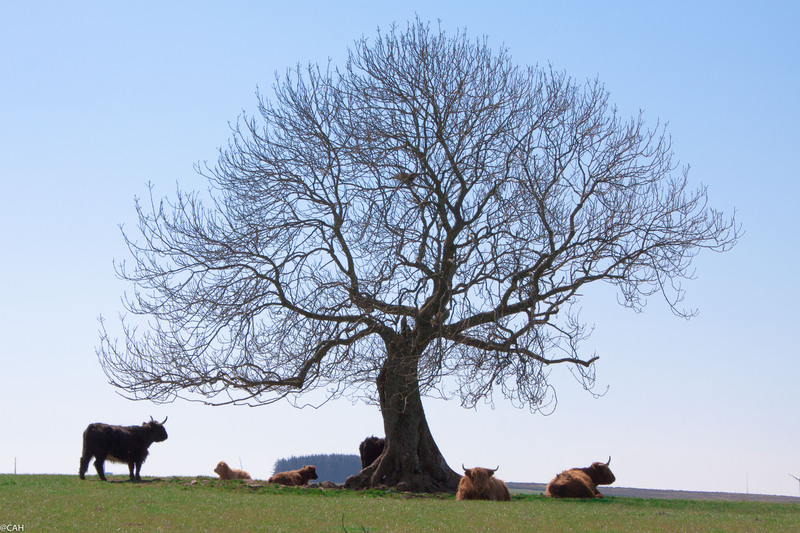 These cattle were hoping to get some shade from the heat by sitting under this tree but it was not yet in leaf. Highland Cattle with their heavy furry coats are not designed for hot weather. All the way down the A7 the grass verges were full of dandelions in bloom and gorse in bloom on the hillside. There is a saying dating from some time from the 19th century that when gorse is out of bloom, kissing is out of fashion. No worries about that today. 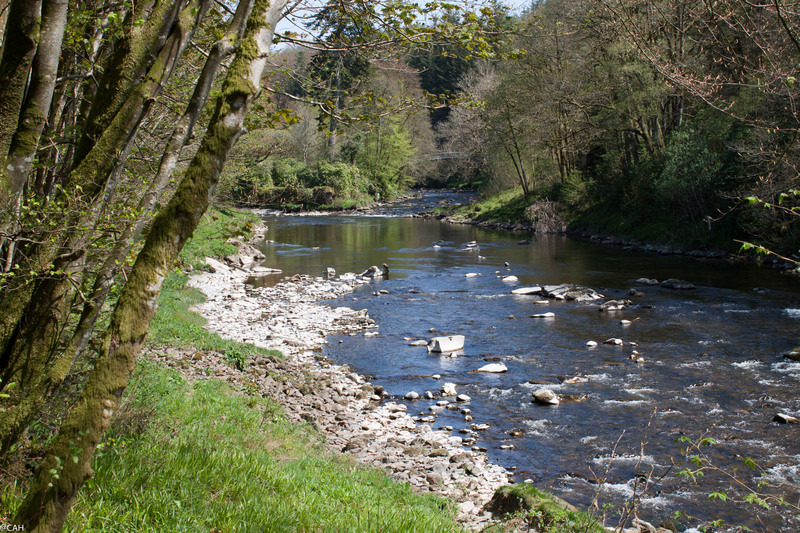 We found a picnic spot just south of Langholm next to a path that led down to the River Esk. It is supposed to be a fishing spot but fish tend to hide in good weather so no-one was fishing today. The motorway part of the drive was uneventful until we got closer to home when due to delays and accidents we got off and drove over the Manchester Ship Canal by the Warburton Bridge and very slowly towards home as the motorway was closed and the surrounding roads gridlocked. 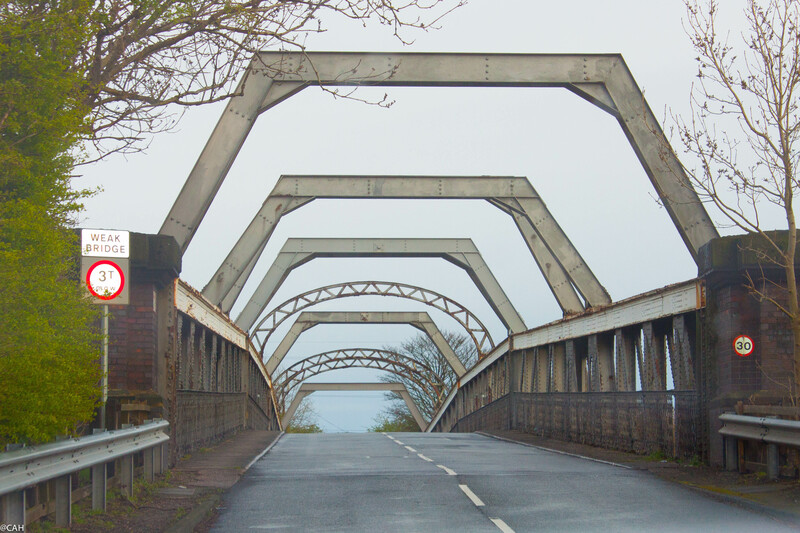 The bridge always reminds me of some we crossed on Route 66 and maybe we will find some more on the Lincoln Highway in a few weeks time. Particularly beautiful shots of the tree and poor overheated Highland Cattle as well as the River Esk. Speaking of heavy, furry coats and the Highlands I can’t resist sharing that my Old Scotch collie Lucy (whose origins are in the Scottish Highlands) has an incredibly thick coat. It’s not too hot yet, and our house is always cold even in the heat of summer, so she’s comfortable.